I have been so busy with my projects for SYTYC and other things I had going on I haven't had a chance to share the tutorials for all my projects I entered in the competition. I am going to start working my way through them starting at the beginning. 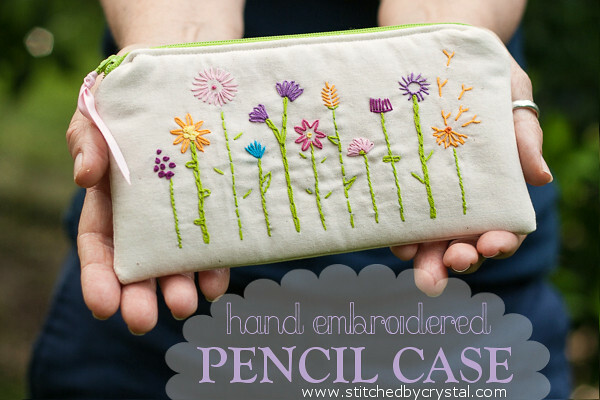 Today I am going to share my back to school themed audition project with you, a hand embroidered pencil case. 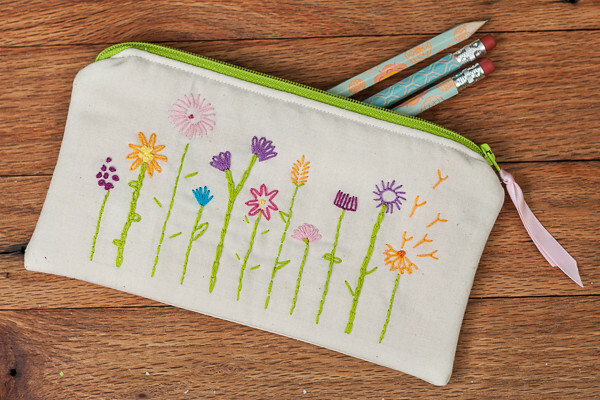 This little case is perfect for holding pencils for back to school, but could also make a great case for make up, your smart phone, glasses, or anything small. It would also make a perfect handmade gift for the upcoming holidays! 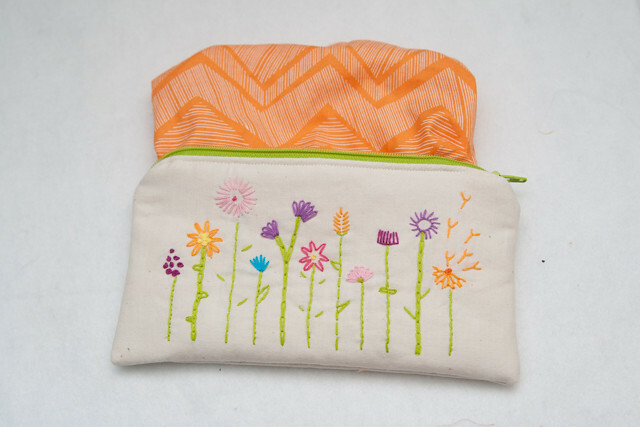 To make this case, you need one 10" zipper, some fabric, fusible interfacing, and embroidery thread. 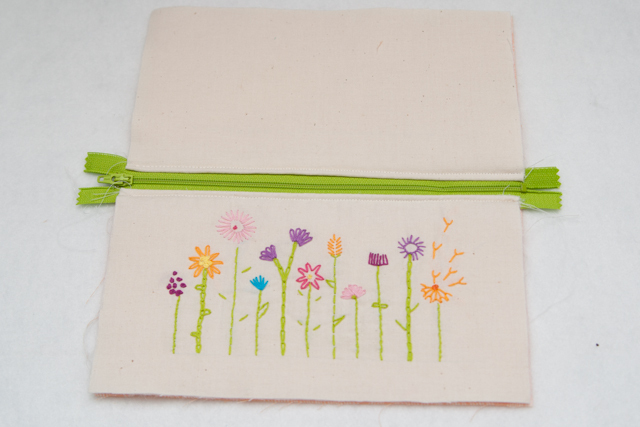 Start by embroidering the flowers on your fabric for the outside of the case. 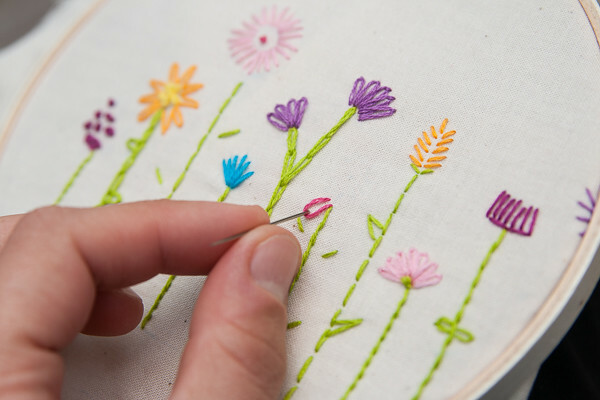 You can download my hand drawn flowers HERE, trace them on your fabric and embroider them with embroidery thread. 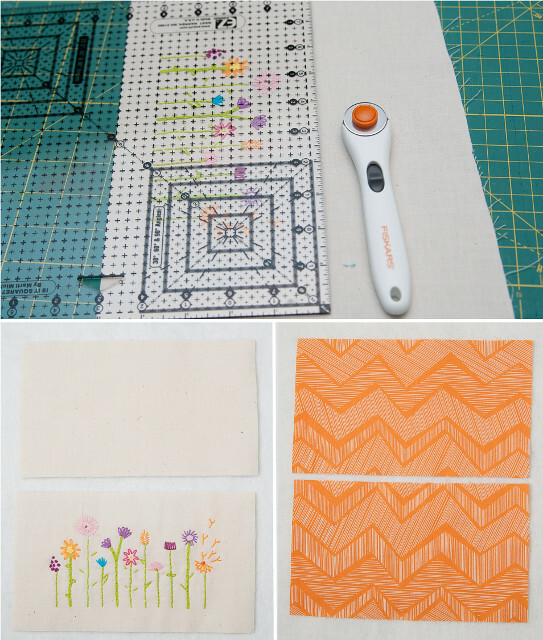 Then cut the fabric to be 10" x 6" with the flowers centered in the middle. Cut a second 10.5" x 6" rectangle from the outer fabric and 2 10" x 6" rectangles from the lining fabric. 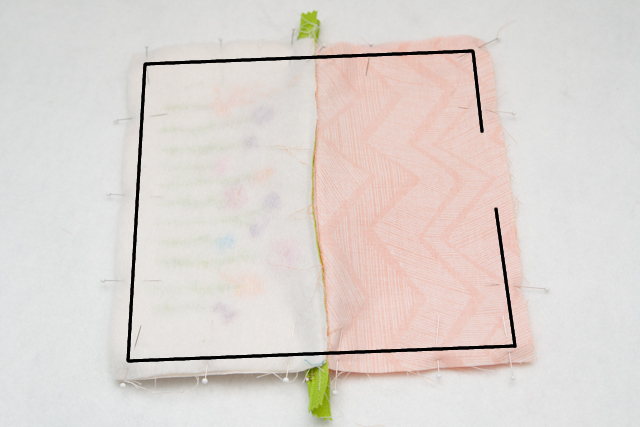 Cut and iron your fusible interfacing to the 2 outer pieces. Lay your flowers face up and place the zipper face down on top. Sandwich the zipper with the lining fabric and pin along the edge. Sew the zipper in place. The easiest way to do this is to position the zipper pull somewhere in the middle, with your zipper foot, sew up to the zipper pull. 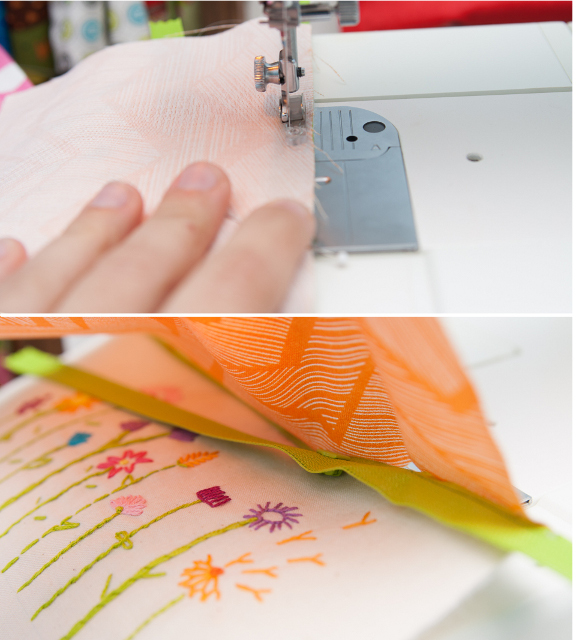 Stop sewing and move the zipper pull past your sewing machine foot, continue sewing where you left off. 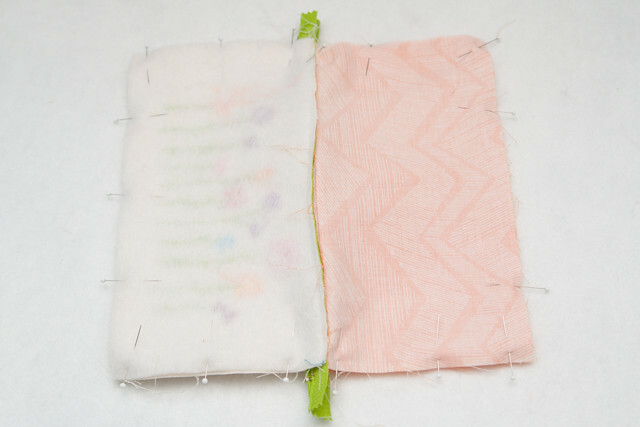 Repeat those steps to attach the outer and lining fabric to the other side of the zipper. Topstitch along the zipper on both sides. 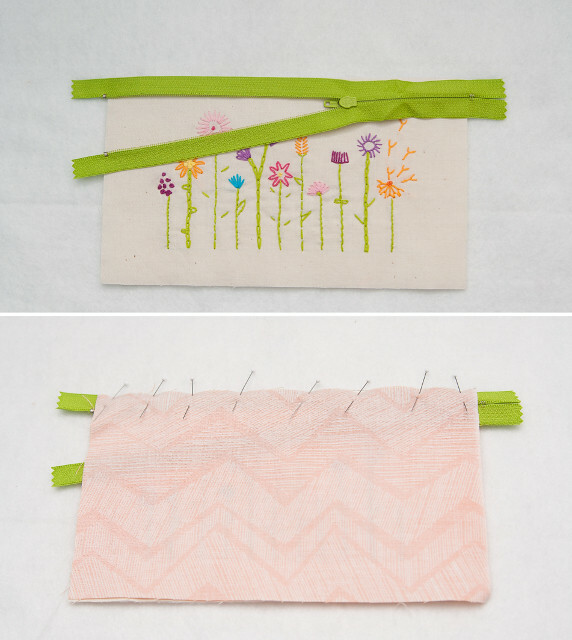 *Make sure your zipper is open* Pin the lining fabrics and outer fabrics together. Fold the zipper towards the outer fabrics. Sew all the way around the case leaving a 3" opening at the bottom of the lining. Turn your case right side out through the hole in the lining. Sew the opening closed and stuff the lining down inside the case. 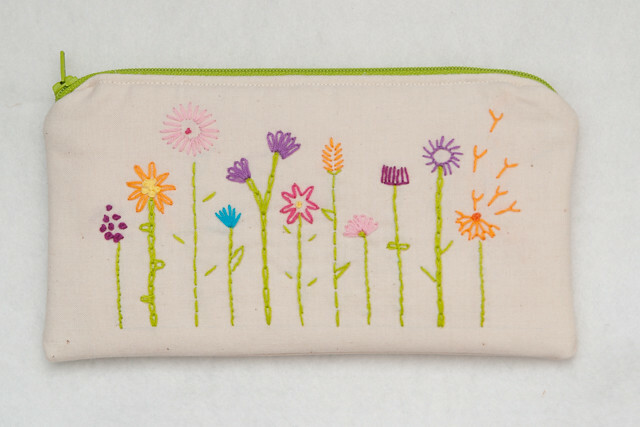 Enjoy your new pencil case! Lindo! Obrigada por compartilhar o tutorial! Gosto muito de bordado, vou tentar fazer. Um abraço, Clau. Thanks Clau! Your embroidery work is beautiful, I would love to see a picture if you make one of these! Oh man… do you have any idea of how much I adore your crafts? You are so sweet Haley! I've just now discovered you and I'm already following your blog! You do beautiful and diverse work! Amazing! So creative :) I love your blog and I have started following you with Bloglovin, if you ever get a chance to check out my blog I would be delighted, thanks! Thank you for sharing this! Do you remember the stitches you used for the flowers and stems? I love it! Every case would be unique and a treasure for a young-or not so young- lady! Your directions also looks like something I could manage to follow. Thanks for sharing. 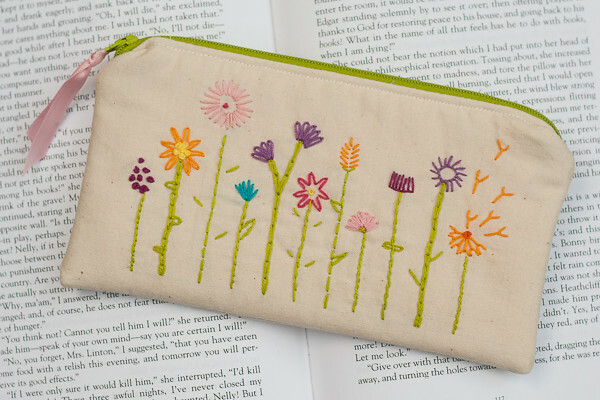 I love this and want to make for my grandaughter, but the link for the flowers embroidery pattern doesn't work - can I find it any where else please? Thanks for such a beautiful idea! I would love to make this for my daughter. It would be better with a little explanation about stitches for stems. Handyman in Toronto Canada Say, you got a nice blog post.Thanks Again. Really Cool.